The most common place to find heated floors is the bathroom. So, it stands to reason that most of the time, trade pros and homeowners are installing a radiant floor heating system under tile flooring. WarmlyYours Radiant Heating’s flagship product, TempZone™ was specifically designed to heat tile, marble and stone floors. TempZone™ electric heating systems are available in four formats — Flex Rolls, Easy Mats, Cable and Custom Mats. TempZone™ Flex Rolls are easy to use and affordable, making them one of the company’s most popular products. In general, they’re installed by adhering them to the subfloor, cutting and turning the mesh for turns, and connecting the system to a thermostat. TempZone Flex Rolls are affordable and easy to install. Of course, there are a few questions to answer before installation begins. 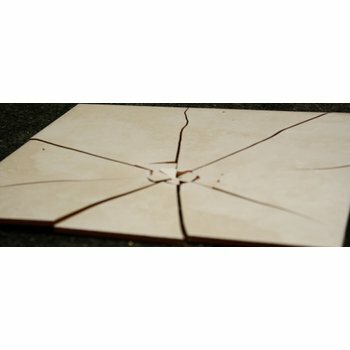 You’ll want to know what kind of thinset to use, if insulation is necessary, how to free-form the cable when necessary, and how to make sure your tile floor is level. By following these step-by-step instructions, you’ll be able to answer these questions and learn just how easy it is to install an electric floor-heating system. 1. Measure the room you wish to heat. Measure the entire room, being sure to exclude permanent fixtures like vanities, toilets, tubs, showers and floor vents. Your complimentary WarmlyYours custom installation plan will detail exactly how your floor-heating system should be installed within your measured parameters. A digital ohmmeter will confirm that your floor-heating system is in good working order. 2. Test your electric floor-heating rolls. Using a digital ohmmeter, test your floor-heating rolls to make sure they are in good working condition. The results should be within 15 percent of the value marked on the UL tag on the product. Sweep the subfloor clean to make sure it is clear of any nails or other sharp objects that could damage the heating element. If your subfloor consists of a concrete slab, you will want to adhere cork or synthetic cork underlayment in a staggered pattern before beginning your floor-heating installation. If your subfloor is wood, underlayment is not necessary. CeraZorb synthetic cork underlayment was installed under this TempZone Flex Roll to prevent heat from absorbing into the concrete subfloor. 4. Install the Flex Roll. Following your installation plan, roll out your Flex Roll until it reaches the other side of the room. Then, cut the mesh (not the heating cable) and turn the roll 180 degrees to continue installation in the other direction. If you need to heat around a pillar or tricky corner, you can free form the cable to be more flexible. Simply remove a portion of the cable from the mesh and free form the cable according to your installation plan. Your installation plan will also detail exactly how much of the mesh should be removed. As the Flex Roll is being installed, use tape or hot glue to secure the mesh to the subfloor or underlayment. Some thermostats (like the Nest) only read ambient (or air) temperature, so a floor sensor is not required. However, if your floor-heating thermostat allows a floor sensor, make sure to position the sensor near the location of the thermostat and precisely in between two heating cables, being sure not to overlap them. To secure it in place, weave it into the mesh or use hot glue. 6. Test the system again. Use a digital ohmmeter and Circuit Check to ensure that the system is still in good working order. Have a licensed electrician connect the thermostat. Finally, spread a layer of modified thinset over the heating element and install the tile on top. To make sure the floor is completely level, you can use a mechanical leveling system, like the Spin Doctor tile lippage control system. Once the thinset has cured, you’re ready to enjoy all the perks of your new heated floor! 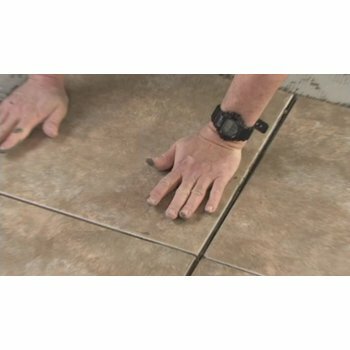 A mechanical leveling system can ensure that you don't experience any undesired tile lippage. 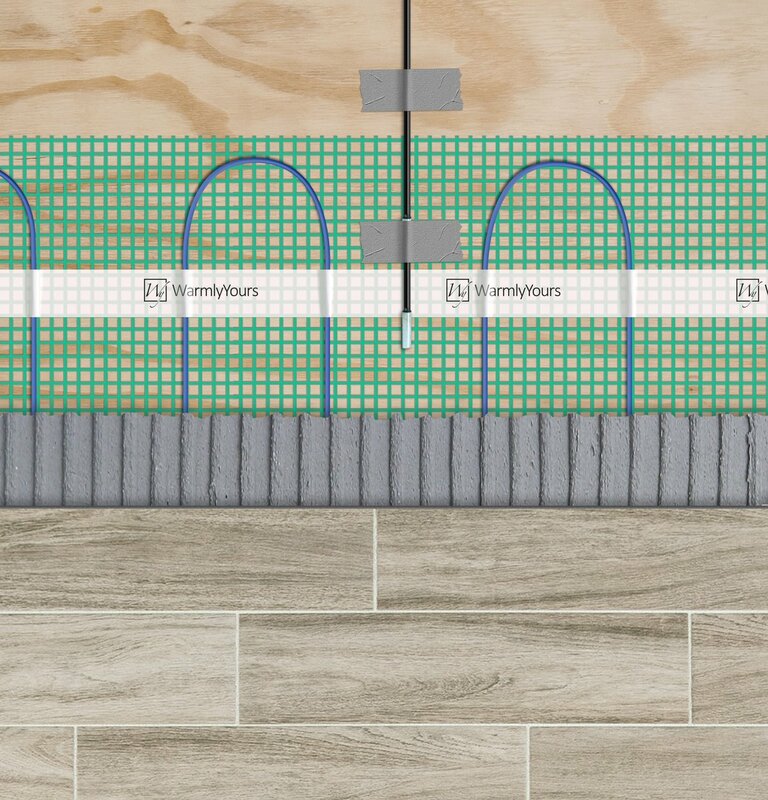 In addition to TempZone™ Flex Rolls, another very popular floor-heating option under tile is TempZone™ Cable with a Prodeso Installation Membrane. This option is more expensive, but installation is particularly easy. Plus, it offers crack prevention benefits as well as a waterproofing option (with separate accessories). For more information about the Prodeso Installation Membrane, click here. You can also learn more about TempZone™ Flex Rolls and the installation process here. Once you’ve familiarized yourselves with the floor-heating systems available, check out the Radiant Floor Heating Quote Builder. It will show you which products are best suited for your project, how much a heated tile floor costs, and more. It’s the best place to start when you’re interested in getting your own heated floors. Previous Post How Much Does Floor Heating Cost in Illinois?